The model takes care of the measurements. EKOI Competition 11 clothing is designed for competition and for serious cyclists. We've selected the highest-quality fabrics made in Italy specifically for use in competitive cycling. The jersey is made of four different fabrics: wind-breaking in front, very light at the back, elastic on the sides and a second-skin effect on the shoulders and sleeves. 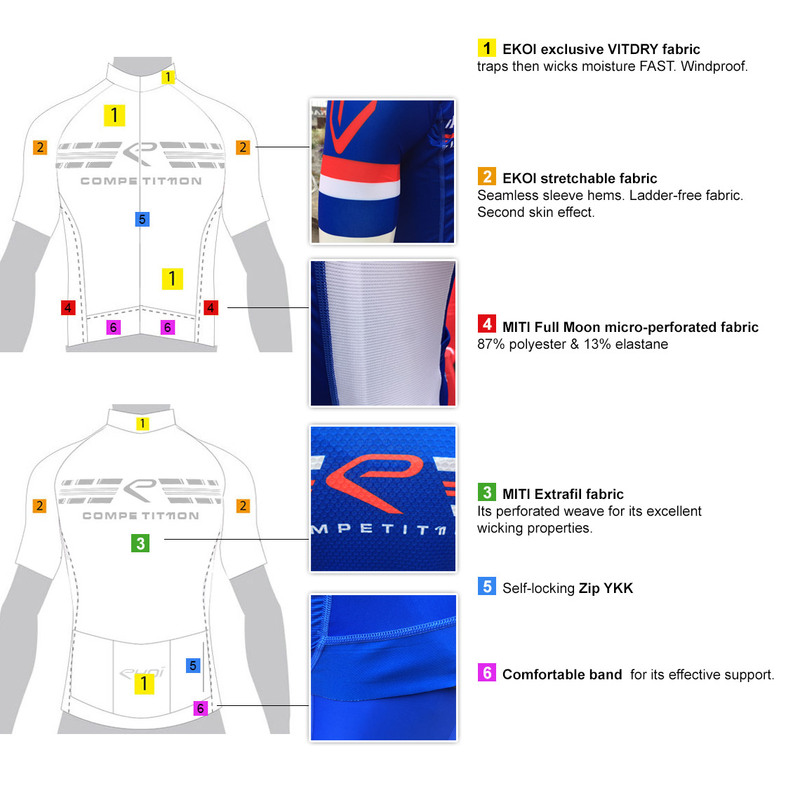 It has a fitted cut, and the back of the jersey is lengthened for better protection of the lumbar region when riding in the drops. The sleeves are longer than usual (like the pros) and laser-cut (no hem). The jersey is meticulously designed, allowing you to practice your favorite sport under the best possible conditions while looking great. - Guaranteed strong and easy to open and close. - Zipper garage (to keep the jersey zipper from rubbing against your bib shorts). - Zippered back pocket for your SOS card. - Wide band at the front of the jersey (5 cm). - Tapered cut for optimal comfort. - Silicone band on the back and sides of the jersey supports the lumbar region. - 1 zippered pocket for your SOS card.